For Freedom and Honor of the Fatherland. The Serbian Air Force and Air Defence (Serbian: Ратно ваздухопловство и противваздухопловна одбрана Војске Србије / Ratno vazduhoplovstvo i protivvazduhoplovna odbrana Vojske Srbije, lit. War Air Force and Anti-Air Defence of the Serbian Army), is the air force of Serbia and service branch of the Serbian Armed Forces. 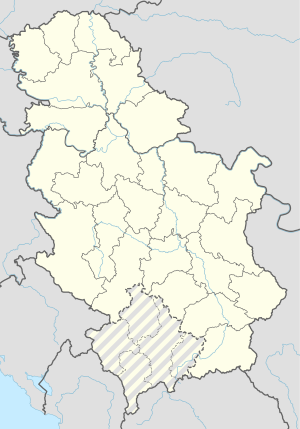 Established on 24 December 1912 in the city of Niš, it was absorbed into the various Yugoslav air forces between 1918 and 2006. Intercepting and eliminating airspace violators. Providing air support and transport for terrestrial units. The first aviation pioneer in Serbia was Lieutenant Kosta Miletić (1874–1953), trained as a balloon pilot at the Technical Aeronautical School near Saint Petersburg, Russia from 27 February 1901 to 25 November 1902. Miletić was also trained in the use of carrier pigeons. On the recommendation of Miletić, the Serbian armed forces posed messenger pigeon stations (in 1908 in Medoševac near Niš and in 1909 in Pirot), and bought two free spherical and one tied kite – balloon from the August Ridinger company from Augsburg. At the reception ceremony, on 19 April 1909, Kosta Miletić flew a spherical balloon called Srbija (Serbia). One balloon was provided from Russia. A gas chamber was ordered from the Dillmann company in Berlin, and a field winch from St Petersburg. A hydrogen unit was provided from the Swiss company Oerlikon. The equipment was delivered to Serbia in 1909 and 1910. The first competition for cadet airmen in Serbia was opened in May 1911, and in the following year the first class of Serbian pilots started their flying training in France from 21 May to 8 September 1912 and got the rank of pilot. They finished the course in the beginning of the First Balkan War with aircraft and the balloons that had already been obtained prior to the outbreak of war. In the autumn of 1912, Serbia got the aircraft for its armed forces. On 24 December 1912 the head of the military ministry Radomir Putnik approved the formation of the Aviation Command situated in Niš; the commander was Major Kosta Miletić. It comprised: the Aircraft Squadron which counted 12 military aircraft, the Balloon Company, the pigeon post and the Base. This date is regarded in Serbia as marking the official founding of the air force. This made Serbia one of the first 15 states in the world to have an air force. The First Balkan War broke out in October 1912; Montenegro, Bulgaria, Greece, and Serbia waged it against the Ottoman Empire. In this war, the Serbian Aviation Command had its first combat experience. In February 1913, the High Command of Serbian Army formed an expeditionary Coastal Airplane Squadron in order to aid the Montenegrin ground force against Ottoman troops who were reinforced at the town of Skadar near the Adriatic coast. Air support for this formation was assigned to the newly established "Coastal Airplane Squad", the first Serbian air combat unit, with 4 airplanes (Blériot XI one-seater, Blériot XI two-seater, Deperdussin TT and Farman HF.20) and 5 pilots under the command of Major Kosta Miletić. In mid-March 1913, this combat air unit was relocated near the frontline at a newly built auxiliary airfield in the village of Barbalusi. The first reconnaissance flight was made on 20 March (March 7, oldstyle), by Lt. Zivojin Stanković and Sgt. Mihailo Petrović. In this combat-reconnaissance flight on his Farman HF. 20 over the Skadar Front on 20 March 1913, Sgt. Mihailo Petrović was killed, thus becoming the first casualty in the history of the Serbian military aviation and the second one in world aviation history. Mihajlo Petrović was the first trained Serbian airplane pilot. He completed his training and exams at the famous Farman pilot school in France and was awarded the international FAI license no. 979 in June 1912. His Serbian pilot's license carries the number 1. The next day, pilots Lt. Zivojin Stankovich and Sgt. Miodrag Tomich successfully completed their first reconnaissance flights, and in the following days, pilots Milos Ilic, Stankovich and Tomich dropped a number of small bombs and conducted reconnaissance flights. A fascinating fact represents that the pilot Tomich and Esad Pasha, the former Turkish commander at the Skadar frontline, would meet in a completely different situation two years later, during the First World War, when pilot Tomich needed help. After Bulgaria attacked at Bregalnica in Serbia, the Second Balkan War began. The first reconnaissance mission had been performed by Miodrag Tomić, and after that Tomić and Stanković took turns and during a period of a month and a half, as the war with Bulgarians lasted, the two airmen performed 21 reconnaissance missions, of which Tomić did 14 flights. During one flight above Kriva Palanka, Tomić encountered a Bulgarian plane in the air, but neither one had weapons and they just greeted one another by hand waving. General mobilization in the summer of 1914 found the Serbian Aeroplane Escadre not well prepared. The Aeroplane Escadre had only 9 aeroplanes of which 7 were in flying condition. Five planes and three pilots were relocated to the auxiliary airfield at Dabića. From that airfield, Captain's Živojin Stanković and 2nd Lieutenant Miodrag Tomić on 13 August 1914 commenced their first reconnaissance flights in the Great War. Tomić took off from the airfield at Jevremovac on 27 August, at five o'clock in the afternoon. Above Mishar he encountered an enemy plane and they were quite close to each other. The enemy plane opened fire on Tomić, who did not expect this, but he avoided it with an appropriate and fast maneuver, so the plane did not sustain any hits. Fire was coming from a Parabellum. It was – probably – the first exchange of fire between aircraft in history. Because of air superiority of the K.u.K. Luftfahrtruppen over the Serbian Front, in March 1915 the French Escadrille arrived (Escadrille MF 99 S) under command of Captain Roger Vitrat (1885 Libourne – 1945 Neuengamme) to aid the weakness of the Serbian Aeroplane Escadre. The French Escadrille held the frontline from Smederevo to Loznica, and the Serbian Escadre from Smederevo to Golubac. After the conquest of Serbia by the Central Powers in the autumn of 1915 and the great retreat of the Serbian army to the Greek island of Corfu, the Salonica Front was formed. During the invasion on Serbia in October 1915, Manfred von Richthofen was commenced its first combat flight as a pilot. Also, in the autumn of 1915, the first medical transport of the wounded and sick in world aviation history was realized in Serbia. One of the ill soldiers in that first medical transport was Milan Stefanik, a Czechoslovakian pilot-volunteer. In June 1916 the reconstituted Serbian army sailed from Corfu and joined the French and British at Salonika. At the Salonica Front line, with the support of the Allied force, the Serbian Aeroplane Escadre was reorganized. From mid-1916 to 1918 at the Serbian part of the new established frontline, 5 Escadrilles (N521, N522, N523, N524 and N525) were operated, and squadrons were staffed with most of French and Serbian personnel. These air force units were officially known as the Aéronautique de l'Armée Serbe or Serbian Army Air Service and were attached to the High Command of Serbian Army which was a part of Allied Macedonian Army or Armée de l'Orient. It was commanded by a French officer, Major Roger Vitrat. In the beginning of 1918 the new reorganisation was started when the 1st Serbian Escadrille was formed on 17 January, and the 2nd Serbian Escadrille on 1 May 1918, staffed with Serbian personnel. Personnel load a Royal Yugoslav Air Force seaplanes operating in the Western Desert, February 1942. The attacking forces engaged in the April War (6 to 17 April) were 2373 aircraft strong, including 1212 aircraft from Germany, 647 from Italy and 287 from Hungary, while the Royal Yugoslav Air Force had 494 airplanes, only 269 of a modern type. Thus the ratio in the beginning of operations was 5:1 in favor of the enemy, and if we count only modern Yugoslav aircraft the ratio climbs to 7:1 in favor of the Axis powers. In spite of huge logistic difficulties and acts of treason (proclamation of the so-called "Independent State of Croatia" on 10 April 1941) the Royal Yugoslav Air Force fulfilled its duties with honor. Yugoslav airmen fought with incomparable courage against an enemy superior both technically and numerically. Especially, the 5th and 6th Fighter Wing pilots showed their bravery. During the war operations (6 to 15 April) a total of 1416 take-offs was made, 993 of which were performed by fighters and 423 by bombers. During this short war 135 flight crew members and 576 ground personnel bravely lost their lives. About 300 Yugoslav Air Force personnel escaped, first to Greece then to Crete. After the Battle of Crete they went on to the deserts of the Near and Middle East, where for a short time they found a safe place. Meanwhile, Field Marshal Erwin Rommel had already arrived with his Afrika Korps. In June 1941 the 20th Hydroaviation Escadrille under command of Lt Vladeta Petrovich with their no surrender war flag was renamed in the 2nd Yugoslav Squadron, attached to No. 230 Squadron RAF. Up until 23 April 1942 the squadron flew 912 combat mission (1.760 flaying hourse) and lost four aircraft. The main mission of the squadron was anti-submarine patrol and protected allied shipping. An important portion of the 1999 war between Yugoslavia and the NATO coalition involved combat between the Yugoslav air force, which was the predecessor of today's Serbian Air Force, and the opposing air forces of NATO. United States Air Force F-15s and F-16s flying mainly from Italian air bases attacked the defending Yugoslav fighters—usually MiG-29s, which were in bad shape, due to lack of spare parts and maintenance. A total of six Yugoslav MiG-29s were shot down in 1999, of which three were shot down by USAF F-15s, one by a USAF F-16, and one by a RNAF F-16. One aircraft, according to a Serbian documentary, was hit by friendly fire from the ground. Another four were destroyed on the ground. During the course of the air war, Yugoslav anti-aircraft defenses downed a USAF F-16C and an F-117 Nighthawk, the first stealth aircraft ever to be shot down in combat. The air force fleet consists of several Soviet combat aircraft, consisting of a number of MiG-21s, and MiG-29s. Serbia is looking to replace its aging fleet with new multi-role combat aircraft. Before its demise, the former Yugoslav Air Force was developing the Novi Avion project which was intended as a replacement. The project was canceled in 1991 due to the collapse of Yugoslavia. Serbia, as the largest succeeding nation of Yugoslavia, took possession of the entire Yugoslav Air Force inventory. After the Agreement on Sub-Regional Arms Control was enacted in 1996, dozens of J-22, J-21 and G-2s have been withdrawn from service. The air force operates from three major air bases, the 204th Batajnica Air Base and 98th Morava Air Base and Constatine the Great Air Base. MiG-29 Russia multirole 14 Six aircraft donated by Russia and four by Belarus. The Serbian air force operates a variety of Soviet surface-to-air missile systems. Many are long-range with a moderate amount of short-range weapons assigned to infantry units. The 250th Air Defence Missile Brigade operates SA-3 and SA-6 surface-to-air missile systems. The military is upgrading both types with fire-and-forget ability. The air force has upgraded "Neva-M" to the "Neva-M1T" standard and "Kub-M" to "Kub-M2". For defending air bases and important infrastructures Bofors 40mm L-70 in complement with M-85 Zirafa radars are used, and for engaging low flight targets 9K38 Igla or SA-18. SA-6 were upgraded also with improved R-60 (missile) and R-73 (missile). Those Air-To-Air missiles are added on the existing SA-6 system. S-125 Soviet Union SAM system 8 batteries modernized by Serbia - all electronics components changed and digitalized, added LCD monitors for displaying information's and added passive guidance via thermal camera. Bofors 40 mm Sweden Autocannon 3 produced in Serbia by Zastava Arms under license. 9K32 Strela-2 Soviet Union MANPADS produced in Serbia by Krusik Valjevo under license. 9K35 Strela-10 Soviet Union produced in Serbia under license including modified version SAVA 10M2J and new modernized rocket by Krušik Valjevo. The inventory includes Marconi S-600 series radars: model S-605/654 Observation radars, and model S-613 Altitude measurement radar; AN/TPS-70 3D radar; AS-74 and AS-84 automatized systems. There are AN/TPS-63 radars out of service. AN/TPS-70 United States 3D Observation radar 5 2 acquired from Slovenia in 2015. Marconi S-600 United Kingdom Observation; Altitude measurement S-605 or S-654 (Observation) and S-613 (Altitude measurement) in inventory from late 1970s. The Serbian Ministry of Defence intended the purchase of new multirole combat aircraft to replace its aging fleet of MiG-21 and MiG-29 combat aircraft. Reports in the media in December 2011 speculated between 12 and 16 aircraft would be ordered and listed the F-16 Fighting Falcon, F/A-18 Hornet, Dassault Rafale, JAS 39 Gripen, Eurofighter Typhoon, Sukhoi Su-30 or the Mikoyan MiG-29M as possible candidates. Military analyst Miroslav Lazanski claimed Russia is offering Serbia 12 MiG-29M/M2 combat aircraft along with S-300PMU-2 and Pantsir-S1 surface-to-air missile systems, as well as two radars for its air defence. In June 2013, defence minister Aleksandar Vučić suggested that Serbia might purchase six MiG-29M/M2s. In July 2013, media reports suggested that Serbia might be interested in purchasing a squadron of medium transport helicopters, preferably the Mi-17. In the summer of 2014, Serbia abandoned its plans to purchase new MiGs from Russia or any other new aircraft in order to put aside 24 million dinars for the overhaul of G-4 supergalebs. This decision depended on the level of scientific-technological knowledge and financial capacity of the state. In January 2016, after Croatia's plans to purchase MGM-140 ATACMS tactical missiles from the U.S., Serbia sent requests to purchase Tor, Pantsir, and Buk air defense systems as well as MiG-29 fighter jets. By November 2016, Russia agreed to provide Serbia with six of its MiG-29s if repair costs are covered (reportedly $50 million). By December 2016, the agreement of shipment of six MiG-29 aircraft had been sealed and they were expected to arrive by March 2017. In January 2017, Serbia's defence minister Zoran Đorđević announced that Belarus will also donate 8 MiG-29s and 2 Buk missile systems to Serbia on a no-pay basis, if Serbia pays for repairs and modernization. In October 2017, Serbia reveived six former Russian Air Force MiG-29s (3 MiG-29Ss and 3 MiG-29UBs), built between 1989-1991, that were donated free of charge from Russia. The aircraft were tranferred to Serbia on board the Antonov An-124 transport aircraft. In April 2018, Serbia received four former Belarusian Air Force MiG-29As under the 2017 agreement between Serbian President Aleksandar Vučić and Belarusian President Alexander Lukashenko. The aircraft were formally handed to the Serbian military on 25 February 2019 at the 558th Aircraft Repair Plant in Baranavichy. This increased the total number of MiG-29s in the Serbian Air Force to 14. With Russia's assistance, all the Serbia's MiG-29s are planned to be modernized to the advanced MiG-29SMT/UBT standards. The Serbian Air Force roundel was officially adopted in 2006. The roundel is an adapted version of the former Royal Yugoslav Air Force roundel which ceased to exist in 1943. It is composed of a blue trim on the outside rim followed inward by the Serbian national colours red, blue and white, with a white cross in the centre with blue trim. The Air Force also uses a low visibility roundel of the same design only replacing the traditional roundel colours of red, blue and white with two grey colour variations of light and dark for contrast; these roundels have most recently been placed on refurbished MiG-29s. Most other aircraft continue to use the standard coloured roundel. The Serbian Air Force observed its centennial anniversary celebration on 2 September 2012, marking one hundred years of its existence by hosting an international air show organized by the Ministry of Defense as the central manifestation. The air show featured representatives from 16 countries around the world and 27 kinds of aircraft. ^ "МИРОСЛАВ ЛАЗАНСКИ – Доктрина министра Гашића - Печат - Лист слободне Србије". Archived from the original on 8 October 2016. Retrieved 11 March 2017. ^ "Yugoslavia Air Force". aeroflight.co.uk. 12 November 2006. Archived from the original on 17 March 2007. Retrieved 24 February 2007. ^ Boris Ciglic (Autumn 2016). The Birth of an Air Service: The Serbian Aviation Command (PDF). Cross and Cockade International Vol 47/3. Archived (PDF) from the original on 20 October 2016. Retrieved 12 December 2015. ^ a b Slobodan Kljakić (2 September 2012). "Sto godina srpskog vojnog vazduhoplovstva" (in Serbian). Politika. Archived from the original on 3 November 2013. Retrieved 1 November 2013. ^ Boyne, Walter J. (1 January 2002). "Air Warfare: an International Encyclopedia: A-L". ABC-CLIO. p. 66. Retrieved 18 January 2017 – via Google Books. ^ M. Galović (29 July 2012). "Prvi srpski piloti" (in Serbian). Politika. Archived from the original on 3 November 2013. Retrieved 1 November 2013. ^ Buttar, Prit (20 June 2014). "Collision of Empires: The War on the Eastern Front in 1914". Bloomsbury USA. Retrieved 18 January 2017 – via Google Books. ^ a b Boris Ciglic (Autumn 2013). Premier Serbian Fighters. Cross and Cockade International Vol 44/3. ^ "Members of the Royal Yugoslavian Air Force crews". armyaircorps-376bg.com. Archived from the original on 13 November 2016. Retrieved 18 January 2017. ^ John Campbell (2013). Royal Air Force Coastal Command: A short history of the maritime air force which protected the United Kingdom's shipping during WW I and WW II. Memoirs Publishing. p. 205. ISBN 978-1-909544-74-1. Archived from the original on 5 November 2018. Retrieved 1 January 2017. ^ Dobson, John; Dobson, Peter G. (27 November 2012). "Grandad's Book – From Biplanes to Concorde". CreateSpace Independent Publishing Platform. Archived from the original on 5 March 2016. Retrieved 18 January 2017 – via Amazon. ^ Lok, Joris Janssen. "How Dutch F-16AMs shot down a Mig-29". Janes.com. Archived from the original on 3 May 2009. Retrieved 7 September 2009. ^ "Niko nije rekao neću, drugi deo Predrag Milutinović pilot" (in Serbian). Radio Television of Serbia. 11 May 2009. Archived from the original on 7 October 2012. Retrieved 6 April 2013. ^ "Mikoyan-Gurevich MiG-29 Fulcrum: Losses & Ejections". ejection-history.org.uk. 17 October 2008. Archived from the original on 17 October 2007. Retrieved 7 September 2009. ^ "Serb discusses downing of stealth". USA Today. 26 October 2005. Archived from the original on 8 March 2013. Retrieved 6 April 2013. ^ a b "Serbia receives four MiG-29 fighter jets from Belarus - defense minister". TASS. 22 April 2018. Archived from the original on 11 January 2019. Retrieved 11 January 2019. ^ a b c d e f g h "World Air Forces 2019". Flightglobal Insight. 2019. Archived from the original on 23 January 2019. Retrieved 6 February 2019. ^ "U Kraljevu održana zajednička vežba Vojske Srbije i MUP-a "Zajednički udar 2018", Vučić: RV i PVO dobija još tri Mi-17 i 4 Mi-35". Archived from the original on 28 June 2018. Retrieved 28 June 2018. ^ Bozinovski, Igor; Jennings, Gareth (23 November 2018). "Serbia receives first H145M helo". www.janes.com. IHS Jane's. Archived from the original on 24 November 2018. Retrieved 24 November 2018. ^ Bozinovski, Igor (4 January 2017). "Serbia buys nine H145M helicopters from Airbus". janes.com. IHS Jane's Defence Weekly. Archived from the original on 21 June 2017. ^ "Serbia fields improved S-125 missile". Janes.com. ^ Administrator. "Modernization 2K12 Kvadrat SA-6 Gainful ground-to-air defense system YugoImport Partner 2013 0307134 – Partner 2013 news coverage report pictures video – Defence and security military exhibition 2013". armyrecognition.com. Archived from the original on 9 October 2016. Retrieved 18 January 2017. ^ saidpvo (25 January 2013). "Сербия модернизирует советские системы ПВО". livejournal.com. Archived from the original on 5 November 2018. Retrieved 18 January 2017. ^ Serbia, RTS, Radio-televizija Srbije, Radio Television of. "Ruski helikopteri početkom juna u Srbiji". rts.rs. Archived from the original on 8 June 2016. Retrieved 18 January 2017. ^ sisteme, Vojska Srbije. "Војска Србије – Наоружање Ваздухопловства и противваздухопловне одбране – Ракетни системи – Ракетни систем ПВО С-125М НЕВА-М". vs.rs. Serbian Armed Forces :: Centar za komandno-informacione. Archived from the original on 16 October 2011. Retrieved 18 January 2017. ^ sisteme, Vojska Srbije. "Војска Србије – Наоружање Ваздухопловства и противваздухопловне одбране – Ракетни системи – Ракетни систем ПВО КУБ-М". vs.rs. Serbian Armed Forces :: Centar za komandno-informacione. Archived from the original on 10 October 2016. Retrieved 18 January 2017. ^ Administrator. "Kvadrat-ML 2K12-ML new Serbian upgraded version of Soviet-made 2K12 KUB air defense system 12306153 – Partner 2015 News Online Show Daily Coverage – Defence security military exhibition 2015". armyrecognition.com. Archived from the original on 12 January 2016. Retrieved 18 January 2017. ^ "Raketni sistem PVO Buk-MB - Tango Six". 9 February 2017. Archived from the original on 12 December 2017. Retrieved 12 December 2017. ^ sisteme, Vojska Srbije. "Војска Србије – Наоружање Копнене војске – Средства за противваздухопловна дејства – Противавионски топ 40 mm Л/70 БОФОРС". vs.rs. Serbian Armed Forces :: Centar za komandno-informacione. Archived from the original on 10 October 2016. Retrieved 18 January 2017. ^ "Peace Research Institute". Stockholm International Peace Research Institute. 2017. Archived from the original on 14 April 2010. Retrieved 30 November 2017. ^ "Home | SIPRI". www.sipri.org. Archived from the original on 3 October 2018. Retrieved 27 March 2018. ^ ""Jugoimport SDPR" radare u Sloveniji kupio za Vojsku Srbije". December 2015. Archived from the original on 22 December 2015. Retrieved 17 December 2015. ^ "Радарски систем С-600". VS. Archived from the original on 10 December 2015. Retrieved 8 December 2015. ^ "Rojters: Srbija kupuje borbene avione" (in Serbian). vesti-online.com. 16 December 2011. Archived from the original on 8 February 2013. Retrieved 8 March 2013. ^ Zoran Glavonjić (29 August 2012). "Vojno vazduhoplovstvo Srbije čeka modernizaciju" (in Serbian). Radio Slobodna Evropa. Archived from the original on 24 November 2012. Retrieved 20 November 2012. ^ Miroslav Lazanski (1 December 2012). "Novi "migovi" i S-400 stižu u Srbiju" (in Serbian). Politika. Archived from the original on 13 April 2013. Retrieved 15 April 2013. ^ "Serbia nears new order for MiG-29s". Flightglobal. 30 April 2013. Archived from the original on 28 July 2013. Retrieved 8 July 2013. ^ "Stižu nam i ruski helikopteri?". www.b92.net. 16 July 2013. Archived from the original on 19 July 2013. Retrieved 21 July 2013. ^ "Serbia lacks money to purchase new equipment for its army". inserbia.info. 21 December 2014. Archived from the original on 4 April 2015. Retrieved 22 February 2015. ^ "Serbia eyes buying Tor, Pantsir, Buk air defense systems, MiG-29 jet fighters". inserbia.info. 15 January 2016. Archived from the original on 13 November 2016. Retrieved 12 November 2016. ^ "Serbia may receive six MiG-29 fighter jets from Russia". Sputnik News. 11 November 2016. Archived from the original on 13 November 2016. Retrieved 13 December 2016. ^ "Вучић: Од Русије шест "мигова", 30 тенкова, 30 оклопних возила". www.rts.rs (in Serbian). 21 December 2016. Archived from the original on 23 December 2016. Retrieved 23 December 2016. ^ Tomkins, Richard (30 January 2017). "Belarus donates MiG-29 fighter aircraft to Serbia". UPI. Archived from the original on 12 June 2018. Retrieved 10 May 2018. ^ "Российские МиГ-29 для Сербии". bmpd.livejournal.com. 4 October 2017. Retrieved 2 November 2017. ^ "Serbia received all six Russian MiG-29 fighter jets as part of military aid". sputniknews.com. 4 October 2017. Archived from the original on 14 March 2018. Retrieved 31 March 2018. ^ "Serbia receives four MiG-29 fighter jets from Belarus - defense minister". TASS. 22 April 2018. Archived from the original on 11 January 2019. Retrieved 11 January 2019. ^ "Serbia formally accepted four RAC MiG-29 fighters donated by Belarus during a ceremony at the latter's 558th Aircraft Repair Plant in Baranavichy on 25 February". Flight Global. 26 February 2019. Archived from the original on 6 March 2019. Retrieved 3 March 2019. 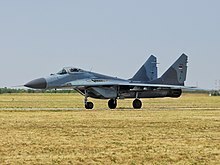 ^ "Belarus gifts Serbia four MiG-29s". janes.com. 23 April 2018. Archived from the original on 2 December 2018. Retrieved 13 January 2019. ^ "Serbia hopes to be through with MiG-29 modernization by Putin's visit in November". 29 July 2018. Archived from the original on 6 March 2019. Retrieved 3 March 2019. ^ "Serbian air force marks centenary". Flightglobal.com. 13 September 2012. Archived from the original on 15 June 2013. Retrieved 23 April 2013. ^ "One Hundred Years of the Serbian military aviation". aeromiting.vs.rs. Archived from the original on 16 October 2012. Retrieved 23 April 2013. Boris Ciglić (2009). Wings of Serbia 1912 – 1920. Infinitas d.o.o. ISBN 978-86-6045-005-2. Boris Ciglić & Dragan Savić (2007). Dornier Do 17 – The Yugoslav Story: Operational Record 1937-1947. Jeroplan Books. ISBN 978-86-909727-0-8. Aleksandar M. Ognjević (2014). Bristol Blenheim – The Yugoslav Story: Operational Record 1937–1958. Leadensky Books. ISBN 978-86-917625-0-6. Wikimedia Commons has media related to Serbian Air Force and Air Defence. Who was Sgt. Mihailo Petrovic? To whom does the man called Zivota Boskovic belong?